The two-week old standoff between the Philippines and China in the Panatag (Scarborough) Shoal located in the West Philippine Sea has spilled over into the cyberspace. The website of the University of the Philippines (UP) has been defaced early Friday morning by suspected pro-China hackers. UP is the national university of this Southeast Asian country. Velasco discovered the website defacement at around 4 AM. He promptly tweeted certain Philippine media personalities and organizations about the matter, explaining later on that he asked the media to contact UP since he was in France and “didn’t know how to contact the university aside from Twitter. In a phone interview, Arao explained that the website’s security is a “shared concern” of the UP System Information Office and the UP Computer Center. “We’re trying to check the vulnerability of our content management systems,” Arao said. He added that although the hackers “merely uploaded a JPEG file in the landing page,” they will also look for possible malicious files embedded in the system. 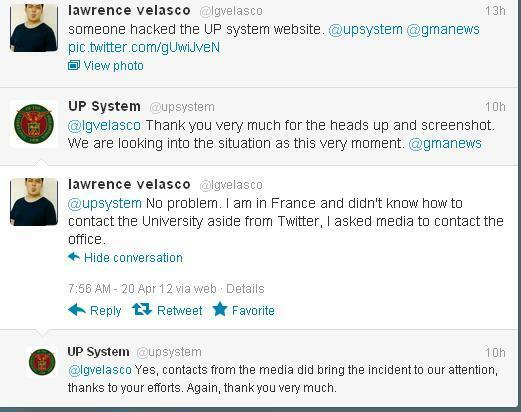 He reiterated that the hacking incident is isolated to the UP system website. Arao teaches journalism in the UP College of Mass Communication. Personal: Professor Arao maintains his own website. This blogger enrolled in his online journalism class during his undergraduate days at UP CMC. This entry was posted on Friday, April 20th, 2012 at 6:13 pm	and tagged with danilo arao, lawrence velasco, philippines-china territorial dispute, Scarborough Shoal, university of the philippines, up system website defaced, up website hacked and posted in journalism, philippines, up diliman. You can follow any responses to this entry through the RSS 2.0 feed. 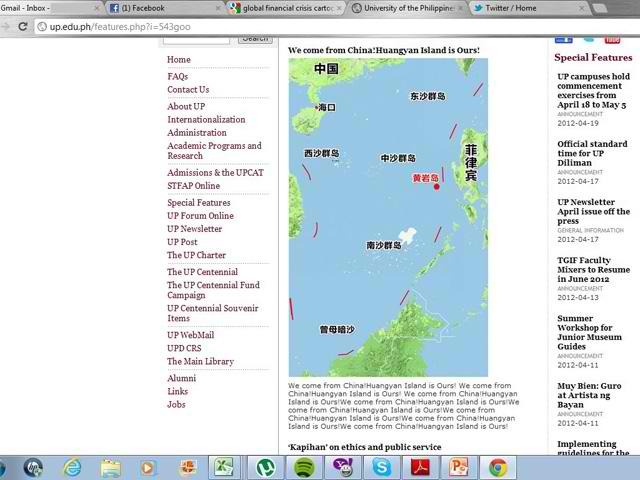 that is scary ,the chinese hackers are up to Philippines internet sites .I hope they already fixed the UP website. Yes, Ms Tess. If the computer system of the country’s top university isn’t safe, then it’s really alarming. I think we have a better chance winning a war in cyberspace than a real one but I hope they find a diplomatic way to settle the rift between the two countries. No worries. PH hackers are the most notorious! I’ve heard that the Filipino hackers retaliate on Chinese sites. The battle is no longer on Scarborough Shoal or Spratlys. It’s heading on to which country has the BEST Hacker (Philippines or China). Yet this is a great eye-opener for the both governments to strengthen security on their websites. Thanks for your comment. And I guess the same thing goes for us bloggers, too. That’s the reason I chose to share this blog in our FBW community. Hi there. I agree. I shall be posting updates soon as to how UP will respond to this. Hacking as I see is for business, for money… This is timely info. This pretty alarming. i hope no harm done in here. Good thing that is the case, for now. But we don’t know what might happen next time.